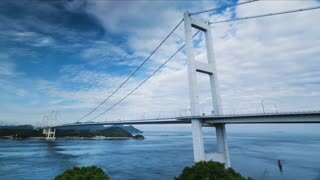 Search Results for "japanese boat"
Time lapse of Japanese boats underneath the giant suspension bridges of Imabari. Woman with chopsticks eating sushi. 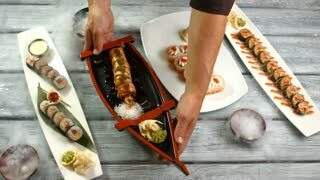 Man's hands with sushi boat. Lunch at japanese cafe. Special dish for regular customer. Plate with sushi rolls. Sushi boat on wooden background. Japanese cuisine at its finest. Treat yourself with delicacy. Hands holding plates with sushi. Male hands show sushi boat. Small bowls with dry ice. Japanese food on white table. Hand with chopsticks takes sushi. Sushi boat of dark color. Lady eating japanese lunch. Well-cooked seafood. Man's hands make sushi boat. Guy pouring sauce onto sushi. Following the traditions. 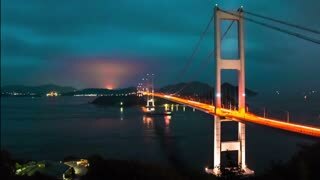 Japanese cuisine in expensive restaurant. Decorative little boat with sashimi Japanese food on ice, raw fish dish. TOKYO, JAPAN -1972: Japanese school girls field trip on a boat. JAPAN 1940s: Japanese soldiers shout war cry / Fisherman on boat / Petals on water / Blossoms on branch / View of river, boat / Petals on water. JAPAN 1940s: Pan of Japanese storefronts / View of city skyline from boat / Views of urban buildings. Japanese Guide Signing As She Takes Tourists On A Boat Tour Of Matsue.